Summer-time is prime holiday season, and you know what that means! It’s the perfect time to get away from the craziness of the city, and relax by the poolside at a resort, with your family. 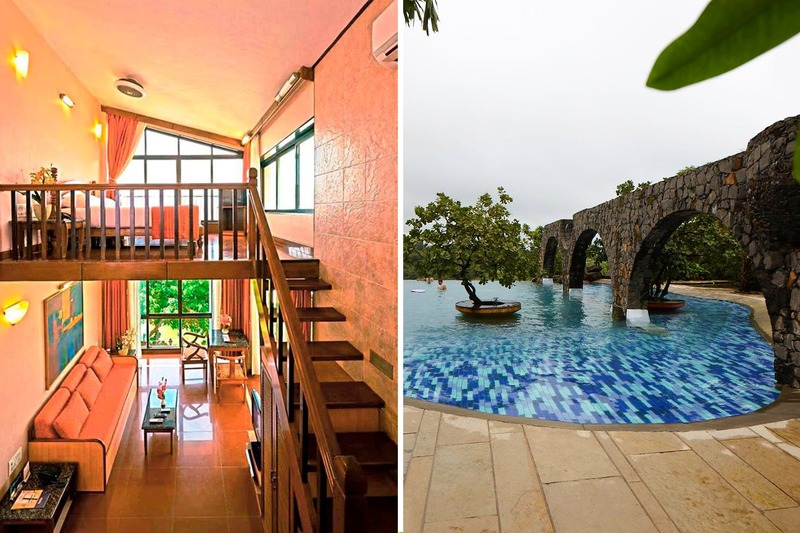 Here’s our round-up of 5 resorts near Pune for family. Panshet Valley Resort is an agro-tourism resort, located in the picturesque surrounding of Panshet Dam. It’s about a 2hr drive south-west from Pune, and you can navigate using the Google map directions provided on their website. Accommodation here is a bit more rustic, available in a machan-style room on stilts, suites, single rooms, a jumbo room (perfect for families), Swiss cottage tents (with en-suite bathrooms), and stone villas (with bunk-bed dormitory style accommodation). Tariffs are priced on a per-person basis, and include both accommodation and meals (breakfast, lunch, tea, dinner). There isn’t a full-fledged restaurant on the premises; instead, meals here are served local-style (cooked on a chulha/with firewood) in the form of chicken or veg thalis. Recreational facilities here include an on-site swimming pool, a bonfire pit, a play-ground space for basketball, futsal, box cricket, and volleyball. Read our full recommendation here. Prathamesh Resorts is located near Warve, about an hour-and-a-half’s drive south from Pune. This premium agro-tourism resort (spread over 7.5 acres) also doubles as an Amusement and Adventure Park, offering outdoor activities like horse riding, cycling, zip-lining, rappelling, artificial rock climbing, a swimming pool, and even rural farming activities. If you’re more relaxed indoors – they also have plenty of board games, table tennis, snooker, carrom, etc. as well as WiFi. We think Prathamesh Resorts offers a good balance of urban and rural living – and would be great fun to visit with your family. They also offer one-day and one-night packages, and you can read our full feature here. Tucked away in the lush green hillside of Wai, The Yellow Retreat is about a 2-2.5 hour’s drive from Pune. Ideal for groups of friends or families, accommodation here is all double-occupancy, and comes comfortably furnished with the basics – including a flat-screen TV, AC, and a balcony sit-out with stellar views. This sprawling 7 acre property offers 360° views of the surrounding Sahyadris, and also has its own swimming pool, a restaurant (by the name of Saki), and plenty of indoor games (carrom, foosball, table tennis, a pool table) to keep you entertained. Breakfast is complimentary, and the rest of your meals can be ordered a la carte. The cuisine served here is local Maharashtrian fare, with a few Chinese and Continental dishes available as well. The Yellow Retreat is especially popular for long weekend stays, and can also be used to host events. Read our full feature on them, here. Kondan ‘The Retreat’ is a great weekend getaway, situated very close to Pimpri. Two styles of accommodation are available here: Amrai – large villas with a private courtyard and in-room jacuzzi; and Tarangan – cliff-side rooms with gorgeous views, an inbuilt floor hammock, and an open-air bathroom. Amrai is ideal for families (owing to the larger space), and the latter is popular among couples – because of the romantic mountain-side views. Room costs include all meals – served buffet-style. In addition to their sprawling grounds and a cliff-side infinity pool, other activities like nature walks, basketball, carrom, and badminton can be arranged for. Groups of 5 people (minimum) can avail a group package, and bookings can be made directly via their website, or over the phone. Read more about Kondan ‘The Retreat’ here. Touted as “Mahabaleshwar’s finest resort”, Brightland Resort and Spa sits in the lap of nature, surrounded by the lush slopes of the Sahyadris, overlooking the Krishna River valley. To get here will take you a 2.5 hour drive from Pune, and it’ll be worth every minute. There are 9 categories of rooms available here (86 rooms in total). Treat yourself to a day of bliss at their Prana Spa – one of the finest in Mahabaleshwar; enjoy a relaxing soak in their jacuzzi, or enjoy the views from their swimming pool. Other activities like their indoor-games room – equipped with carrom, foosball, air hockey, and table tennis; theirtoddler/kids’ zone, library, gym, and sports courts (tennis, volleyball, basketball) and ensure that there’s something for everyone – regardless of their age. Brightland has their own restaurants, featuring multi-cuisine and BBQ fare, as well as a lounge-bar overlooking the Sahyadris. Breakfast is included in the room fare, and 24-hr room service is available on-demand as well. Prices are a little steeper than most hotels in the area, but the standards at Brightland make it worth your while. Read our full recommendation here.